Lettuce wraps are such a versatile meal. I mean…essentially you can put anything you want in them. Sort of like a taco, but not quite. The lettuce leaves are a virtually tasteless, non-carby vessel by which to shovel in delicious ingredients of your choice. Who wouldn’t love them?!?! Especially when they’re stuffed full of Thai-flavored chicken and rice noodles?!?! It’s no secret that I love Thai flavors…they’re all over the blog. Tons of recipes. Movies like Broke Down Palace have ensured I will never actually visit Thailand, but I can always experience the flavors in the safety of my own home. Instead of a Thai prison. Yeah, yeah it’s just a movie, but people…crazy stuff like that happens for real. And I’m not about to have some crazy plant drugs in my bag and get sent to prison for the rest of my life in foreign country. Nope, nope, nope. But my taste buds can visit there, as often as my little heart (and mouth) desires. 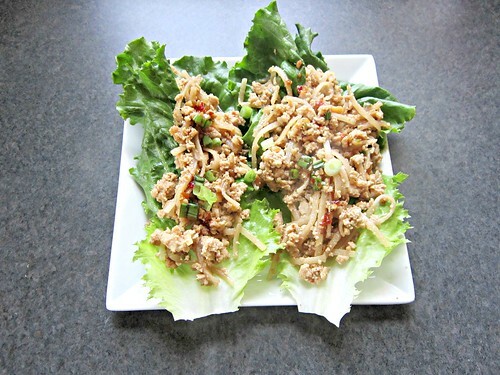 These lettuce wraps were so easy to make, and I love the addition of the rice noodles. The sauce is amazing and the lettuce leaves and chopped peanuts have just the right amount of “crunch” to balance out the softer noodles and chicken. These are great for a weekend lunch, or a weeknight dinner! In a small bowl, combine the soy sauce, oyster sauce, water, chili paste, honey, ginger, lime juice, garlic, green onions, rice vinegar, and cornstarch. Whisk so they are well combined. Place the chicken and peanuts in another bowl, then pour 3/4 of the sauce mixture in and stir to combine and evenly distribute. Allow to sit and marinate for about 15 minutes. In a large skillet, heat the sesame oil over medium heat. Add the meat and peanut mixture and cook for about 10 minutes, or until cooked through. Add the noodles and cook for another 5 minutes or until noodles are soft, but not mushy. Remove from heat, scoop mixture into lettuce leaves, top with cilantro, green onions, peanuts, and the reserved sauce.